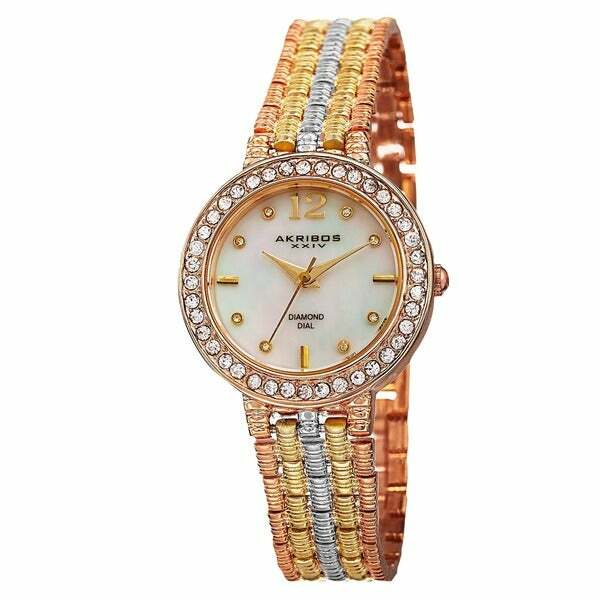 This charming timepiece from Akribos XXIV showcases a mother of pearl dial. Powered by Swiss quartz movement, the dial displays genuine diamond markers. A beautifully detailed bracelet completes the glamorous look of this women's watch. Watch is prefect, goes great with gold and silver bracelets. Very beautiful watch. I really love the box and the gorgeous packaging that the watch came in. The band is very easy to get on and off.I will definitely recommend this product. This one is a show stopper. Great for my daughter who works as an event planner. Great for classy events or even casual. Quality is great and price is too. The only downside was that the extender did not fit into the watch; since my daughter has a small wrist, it is not an issue, but if the extender is needed, there is no guarantee that it will work. This watch is beautiful in person! Bought as a Christmas gift for my Mom and she loved it. Looks good with any outfit and mixes well with other jewelry. beautiful watch, goes with everything! This is a very pretty watch, a little but it is just like the discretion says. Very pretty watch. A great value for the price. Nice for day or evening, and not too big or too small. We are very happy with it, and wonderful to travel with. Saw this watch and really loved the look, however when it arrived it was missing a stone around the face. It was quite obvious, so I sent it back. Very pretty, easy to read. Received as a gift and I enjoy wearing a very pretty watch. "I need to send my recent watch (AKRIBOS XXIV) in because it is not water resistant. All I did was wash my hands and the watch obviously is not water resistant. After washing my hands, I noticed that the lens was foggy. After that, it quit working. Please help me." Hello marsha, you will be contacted by Customer Care. Have a great day. Because it is different from what I have bought before.